1. World trade volume increased in February for the seventh consecutive month, bringing global trade to a new all-time record high (see chart). 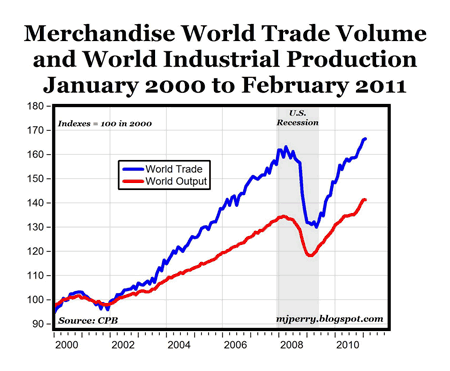 This was also the third month in a row that world trade was above the previous peaks during early 2008 when the U.S. recession and financial crisis started spreading, causing world trade to drop by 20% in 2009. 2. World trade in February was 10.5% above its year-ago level, and marked the 14th consecutive month of double-digit annual growth starting in December of 2009. Compared to the cyclical high in April 2008, world trade volume has recovered to a level that is now 2 percent higher than its previous peak. Compared to the cyclical low in May 2009, global trade has increased by 28% through February of this year. 3. World industrial output was the same in February compared to January, but was above its year-ago level by 7.4%. World output in the first two months of 2011 established a new, all-time record high level, which is 5.2% above the previous cyclical high of 134.4 in March 2008 (see chart above). After falling by 12% during the global recession in 2008-2009, world output has increased by almost 20% during the last two years of a strong global rebound. Global output has increased in almost every month compared to the previous month during the worldwide recovery that started in 2009, with only one month of decline in industrial output in the last two years. Bottom Line: Based on the ongoing and solid improvements in both international trade and world output, especially the fact that global trade and production are both at all-time historical highs, I think we can now say that the world economy has made a complete recovery from the financial crisis and global slowdown in 2008 and 2009. The remarkable recovery in the global economy over the last few years is a testament to the ability of markets to recover from even a severe financial crisis and the worst economic slowdown in generations. Even though there are still many uncertainties and headwinds moving forward, the strong world economic recovery so far is both remarkable and encouraging as we hopefully have entered a new period of global growth, expansion and prosperity. Dr. Mark J. Perry is a professor of economics and finance in the School of Management at the Flint campus of the University of Michigan. He holds two graduate degrees in economics (M.A. and Ph.D.) from George Mason University in Washington, D.C. and an MBA degree in finance from the Curtis L. Carlson School of Management at the University of Minnesota. Since 1997, Professor Perry has been a member of the Board of Scholars for the Mackinac Center for Public Policy, a nonpartisan research and public policy institute in Michigan. How Do You Spell W Again?